I’m saying a silent prayer of thanks to Ichiro’s wife, Yumiko, who urged him to stay with the Mariners instead of moving to the other team Ichiro was seriously considering–the Yankees. In an interview with the Kyoto News, translated by Agence France-Presse, Ichiro says he considered returning to Japan, staying in Seattle, and joining the Yankees or Red Sox. “Not only I but also Yumiko feel impatient at not being able to go to the playoffs for years,” Ichiro said. But, in the end, Seattle won out, and at Yumiko’s urging. I was wavering but let on an air like I wanted to play in Seattle. Yumiko sensed it and told me, ‘You don’t want to leave here, do you?’ I felt like I got encouragement. 34-year-old Ichiro signed a five-year deal with the M’s in July. 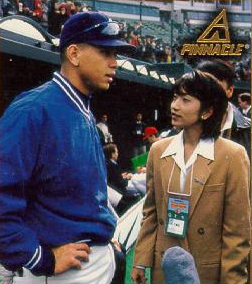 That’s Ichiro’s wife Yumiko Fukushima interviewing Alex Rodriguez when she was a television reporter.